This is a large green hilly map, with fog distances and nodes placed in artificial structures. Plenty of flying and long-range action, along with some crazy links. This is what we want! This is what we’ve got! Enough said. Another large hilly map with beautiful scenery, featuring Japanese temples as bases. A “middle earth” map set in a cramped village. Some roads are tight for vehicles (and there’s no ramps or slopes outside of the roadways) but it also includes monsters – expect to battle Kraal, Brutes and a Warlord… I rammed him over the bridge with the Hellbender and left him trapped beneath it. It will take a few gameplays to learn the map layout, since many nodes appear to be hidden inside buildings and the built-up area blocks a lot of lines-of-sight. However, it’s fun to let the bots be distracted by monsters whilst you get on with seizing nodes. A truly beautiful map, very green and colourful countryside. Some wonderful high-detail textures, it almost makes it a shame to spoil the lovely views with rocket damage. There are one or two places where a manta can be used to ascend the hills, but trees may block the way badly, so be careful of texture clipping. Another “floating platform” map, so beware of falling off the edge. Why don’t those crazy map designers actually observe health and safety, eh? It’s not like life is cheap now, is it? This map is completely node-crazy (20 nodes?) arranged in a cat’s-cradle of insanity. However, not all need to be seized to link to the opposition’s core – there are numerous path combinations so it’s perfectly possible to have both cores vulnerable at the same time if you’re not careful. And it has plenty of Ion canon goodness. 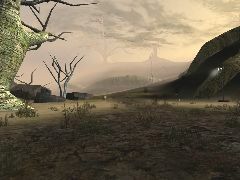 Muddy barren wasteland with broken buildings, reminiscent of Call of Duty (or Medal Of Honour) – you’re dodging in and out of ruined buildings with an eerie fog surround. The scorpions seems a bit out of place, but the tanks add to the sensation. Manoeuvrability is tight with fast-moving vehicles, and the shell craters don’t make it any easier. A tricky map to play – especially with asymmetric node placement, but good fun. Note: the previous map uploaded (ONS-Spiffingrad-T32.ut2, 2004) is the earlier version, smaller and asymmetric. The link has now been corrected to the newer one (ONS-SpiffingradSE-TSE.ut2, 2005) which is a larger map, containing more nodes spread out. Unfortunately whilst the filenames are different, the map names are the same, so UT will only pick up the first one in your maps directory. Be sure to delete it before adding the second one in place! A brownish-red sunset over late autumnal evening, featuring 9 nodes. Not very much natural vegetation around but a few rock bridges. Note that some nodes are hidden inside mountain ranges, only accessible via the artificial tunnels, meaning there’s a bit of a search for them! Another map from David Green, the fellah that brought you Fallout Island. It truly is a beautiful map, comprising of a massive 11 nodes, arranged in a horseshoe formation so you’re not facing cores but need to navigate around the playfield to finally attack the bases. A wonderful design. This is a truly nuts map (19 nodes!) 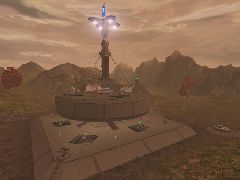 consisting of a suspended playfield with plenty of heavy-damage weapons – namely ion cannons. Longevity may be a bit limited if the game descends into exchanging ion fire with high mortality rates. The low-gravity aspect means large distances can be covered on foot quickly enough. .